Mirova recognized as “Energy Investor of the Year, Europe” for 2016 at the Infrastructure Investor Awards. We are proud to announce that Mirova won the prestigious “Energy Investor of the Year, Europe” award for 2016. The award process drew thousands of votes from the global infrastructure investment community, who selected from a shortlist of four nominees to select which firm best represented the energy asset class in Europe, for 2016. 2016 was a tremendous year for Mirova, especially in terms of energy infrastructure investments. First, we closed our third-generation fund dedicated to greenfield renewable energy assets in Europe, Mirova-Eurofideme 3, with a commitment of €350m – well above its €200m initial target – with the support of numerous renowned institutional investors. We also partnered with the European Investment Bank for its first co-investment in a Swedish wind farm through the European Fund for Strategic Investments, at the heart of the Juncker Commission’s Investment Plan for Europe. Another milestone was achieved when we closed the largest greenfield renewable energy deal in France in September 2016 (€300m) for which Mirova co-invested alongside project developer Valeco. In 2016 alone, our renewable energy team helped finance around 300MW of solar, wind and biomass projects representing nearly €600m of capital expenditure in low-carbon electricity generation in Europe to which Mirova-Eurofideme 3 contributed more than €100m in equity or mezzanine. Equally, our general infrastructure team contributed to these energy financing efforts, through its Mirova Core Infrastructure Fund, with its first deal sealed in Italy through an investment in a district heating network. These accomplishments were made possible not only by the consistent and quality work of our investment professionals, but also due to the support and confidence granted by our clients and business partners. Therefore, we would like to thank them all for their contributions to this collective success and industry recognition. 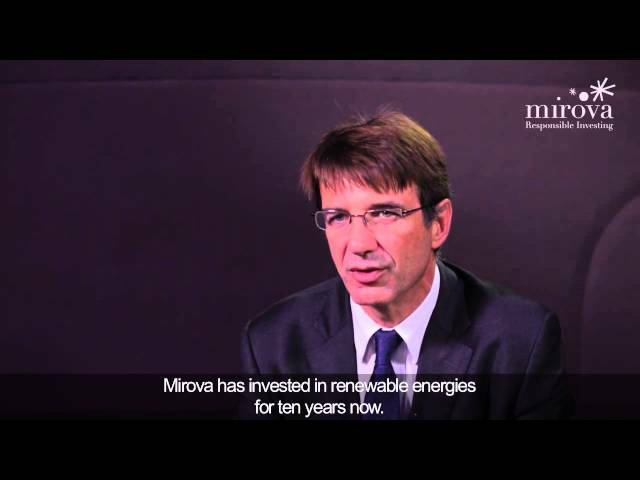 With over 15 years of experience in the structuring and management of renewable energy and infrastructure funds, Mirova strives to provide prominent institutional clients with long-term investment opportunities in greenfield and brownfield projects across Europe while supporting the development of sustainable and resilient infrastructure surrounding communities and local economies. Please click here to view the full list of Infrastructure Investor Awards 2016’s winners. Infrastructure Investor’s annual awards are one of the industry’s most comprehensive, and voted on entirely by the industry for the industry. That is, they are totally independent; there is no sponsorship, no panel of judges. The winners truly reflect the esteem in which they are held by peers. Mirova-Eurofideme 3 has not been authorized by the French Financial Market Authority (“AMF”) nor by any other supervisory authority. Mirova Core Infrastructure Fund has been authorized by Luxembourg Commission for the Supervision of the Financial Sector (“CSSF”). These Funds’ investment objective, strategy and main risks are described in their regulatory documents. Their fees, charges and performances are also described in these documents. Investments in infrastructure funds are mainly subject to loss of capital risk. They are reserved for specific investors, as defined by their respective regulatory documentation. Any reference to a ranking and/or an award does not indicate the future performance of the UCITS/AIF or the fund manager.